Fashion store - Forever 21 has stepped up their game big time and they mean business. 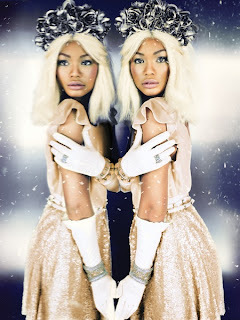 Getting Supermodel, Chanel Iman as the latest face of their brand is major! 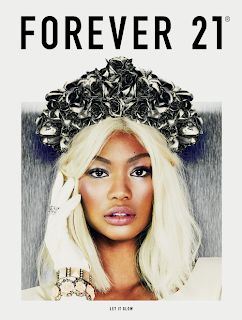 The 21 year old glows in Forever 21's "Let It Glow" Holiday campaign. Rocking a blonde wig in some and a black in other pics - Chanel Iman turns it right up by voguing it in this photoshoot adding a little bit of couture poses. The ad for the "Let It Glow" campaign, features a very joyful/young Chanel having fun and looking very comfortable in the High Street pieces of clothing.